A potato is one of the most versatile food ingredients we have today. When you use this root crop in a recipe, you can make it as the main dish or a side dish. Like I said, it complements other recipes as added ingredients and also works for filling. However, potatoes are usually needed in large amounts, right? And they can be a bit difficult to slice (since they’re quite tough). So, yes – that’s why you need the best potato slicer in your kitchen. This tool will really help you a lot. Which is the Best Potato Slicer and Why? Fast movements can create uniform sizes of sliced potatoes. For mandoline slicers (video), gliding through the blade system will slice potatoes effortlessly. For a potato slicer with a simple design, applying pressure on the blade attachment will produce several pieces of sliced potatoes in a single motion. Depending on the model, a simple adjustment (or turn of a knob) can produce different sizes, shapes and thickness of potatoes. 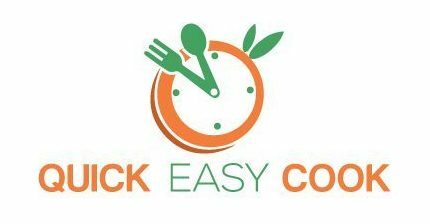 Food preparation time will be cut shorter (especially if you need a lot of potatoes). Uniform sizes and shapes of potatoes can be produced when you use a tool instead of cutting each piece manually. It’s safe to use a potato slicer as this tool is usually designed with a hand guard or a food holder to keep your hands away from the blades. Having the ability to create different types of slices will make your food more appealing. The task of slicing food (especially potatoes) will be made simpler and easier. If you are keen on buying a potato slicer, consider the things listed below before making your final choice. Food safety – To avoid exposure to harmful chemicals, see to it that you choose a potato slicer that uses food-safe materials. For models that use plastic parts, these should be BPA-free. Multipurpose design – For practicality, go for a model that’s not only useful for cutting potatoes but other types of food as well. Overall Construction – Keep in mind that potatoes are quite hard. Therefore, choose a unit that’s built to handle tough ingredients. Price – Although price is always a consideration, don’t just go for the cheapest model available on the market. If you’re always preparing food, getting the best slicer that you can afford will be a big help in the kitchen. Equipped with 4 Japanese stainless steel blades for fine, medium, coarse, and straight slices, this model is very simple to use. There’s a knob that you can turn and adjust to pick the right settings for your needs. Since the blades are very VERY sharp, a handguard comes with the unit to protect your fingers when slicing potatoes. This model also comes with a rubber base to add stability while using it. Also made with BPA-free plastic parts, this potato slicer is safe to come into contact with food. In fact, you can also use it for other types of food ingredients. Time saver – It’s designed to deliver fast results. Stable – It comes with non-skid base. 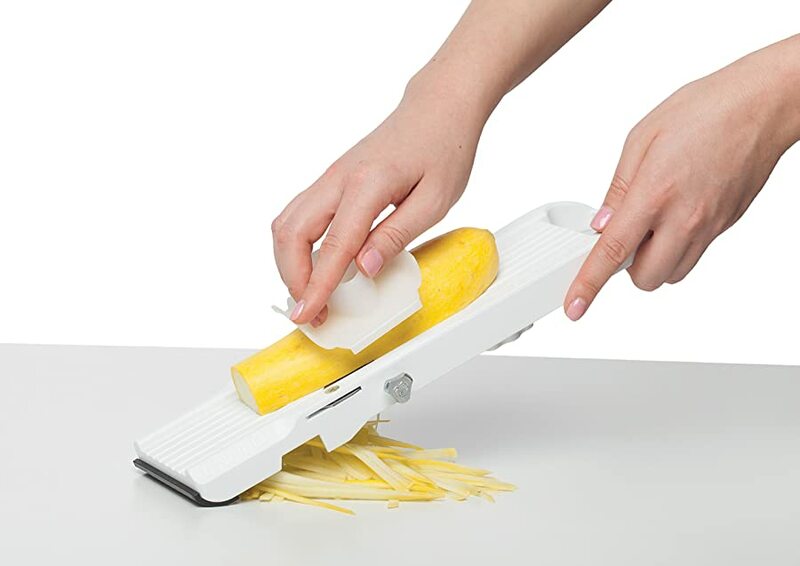 Easy to use – Just snap the desired blade on and slide the potato (or other ingredients) onto the surface of the unit. Sharp blade – This potato slicer can produce clean cuts of potatoes. Easy to store – It has a compact design that makes it easy to store when not in use. Easy to clean – It’s dishwasher safe and can be disassembled for easy cleaning. Narrow surface – The narrow working area makes it a bit limiting to use. Hassle to use – You will need to manually change the type of blade in the unit for every type of slice. This model uses Japan-handcrafted stainless steel blades – that alone says a lot about its quality. It’s also safe and easy to use since it comes with a handguard. The overall design also makes it a simple yet effective kitchen tool. This mandoline potato slicer comes with V-shaped blades installed into the device. The blades are made of stainless steel and are, therefore, corrosion-proof. You can make different types of slices with this model. The straight design allows you to make regular slices, the wavy blade can make crinkle cuts, and the julienne setting can make French fries. 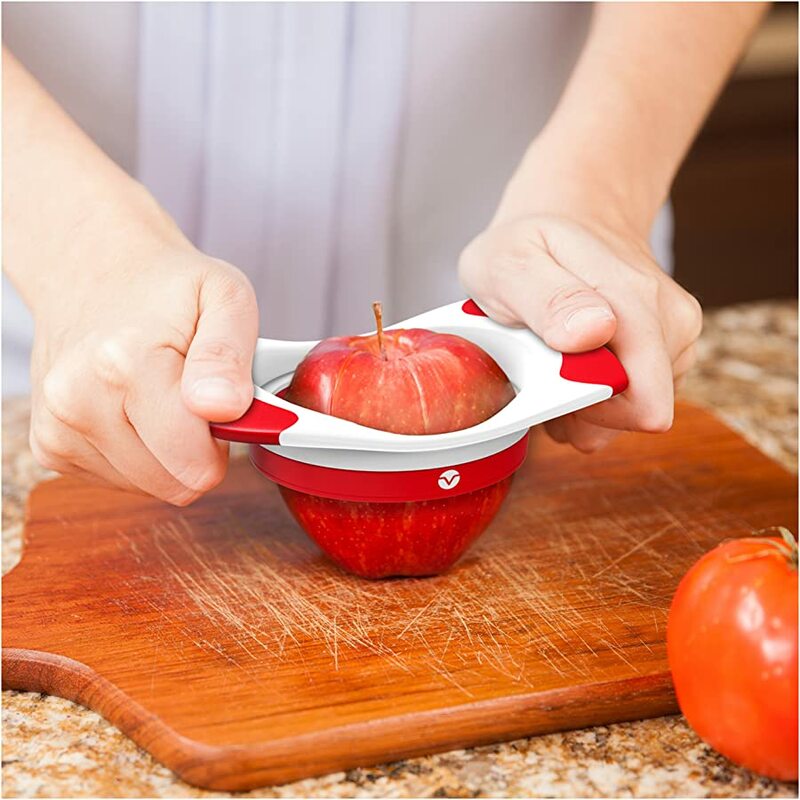 Since it comes with a food holder, your hand is kept safe as it stays away from the blade system. The unit itself can also be locked close when it needs to be stored. For cleaning, the main body is dishwasher safe (top rack) – but the blades need to be hand washed. Comfortable to use – The turning knob and handle are soft and easy on the hands. Safety mechanism – It comes with non-slip footing mechanism. Versatile design – This model can do a lot of different types of cut like slicing, dicing, shredding, etc. – all adjustable by turning the knob. Easy to use – Sliding food along the sharp blades enables the unit to produce sliced food quickly. Sturdy and high quality – With due care, this model can last for a long time. Thin French fries – It can only produce thin types of French fries. Plastic materials – The plastic parts are not stain resistant. This model can be a great option if you’re a great fan of homemade potato chips and French fries. The blades are sharp and rust-resistant and will enable you to slice food easily. For a handheld mandoline slicer, this model makes for a fine choice. In spite of its simple design, you can adjust its settings into 3 different sizes. You can also place it directly over the container to catch the sliced pieces instantly. Its main body is also transparent – which allows you to see the content below. Made with nonslip handle, knob, and footing, this unit is safe to use. It also comes with a food holder to keep your hand away from the blade during the cutting process. Easy to use – The thickness settings can be easily adjusted according to your needs. Simple operation – When changing blade settings, there’s no need to remove the blades. You simply need to adjust the blade height by turning the knob and proceed with the slicing (sliding) action. Comfortable to use – The parts are easy to hold on to and won’t give you hand fatigue. Easy to clean – This unit is dishwasher safe. Lightweight – Using and manipulating the device is not tiresome. Small design – It’s not capable of handling big jobs (and big potatoes). Not that sharp – Although this model is capable of slicing regular potatoes easily, the blades are not that sharp to slice through sweet potatoes. This model works like a mini mandoline – so, it makes for a good option if you’re looking for a handheld model of mandoline or potato slicer. Just keep in mind that its small design also limits its efficiency as a potato/ food slicer. Here’s a professional mandoline slicer that can also be considered a commercial-grade model. It comes with 4 adjustable settings to fit your requirements. It also comes with 2 julienne slicer settings for your French fries. There’s even a waffle-type cut design that can’t be found in regular models of mandolines and potato slicer units. Since it comes with a wide surface, you can glide food ingredients on the deck easily. Yes – aside from potatoes, you can also use this model to slice other types of food ingredients. To operate in different settings, you can adjust the blade knob to the type of cut that you need for your potatoes (and other ingredients). This model also comes with a handguard and a non-slip base to make slicing potatoes not only easy but safe as well. Very well-made – When properly used, this model will last for a long time. Sharp blades – Slicing hard types of food is not a problem. 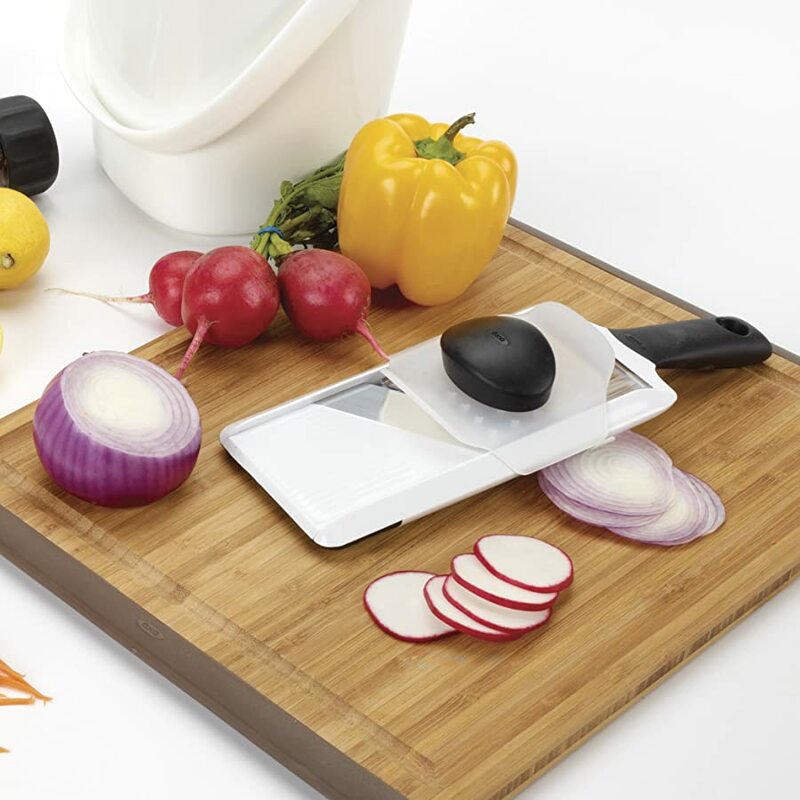 Easy to use – All you need to do is glide food ingredients over the blades (on the deck) to slice them. 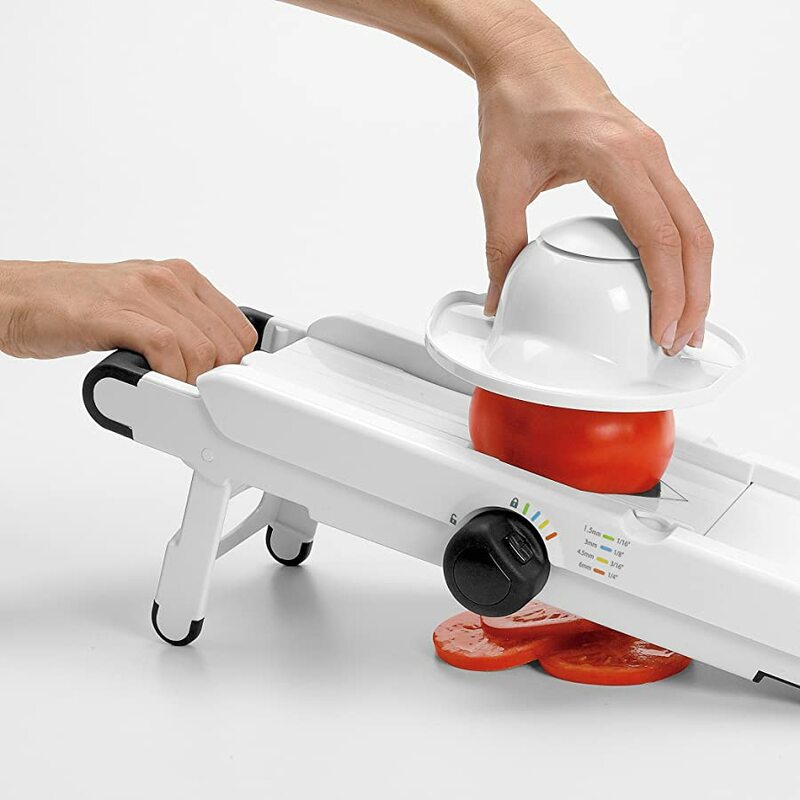 Versatile – It comes with interchangeable settings when cutting food. Easy to clean – To clean, you can rinse or submerge the unit in water. It’s also dishwasher safe. Plastic materials – Since it’s made of plastic, avoid dropping the unit as it could break easily. No dicer option – If you are particularly looking for a dicing option in a potato slicer, this model may not be for you. 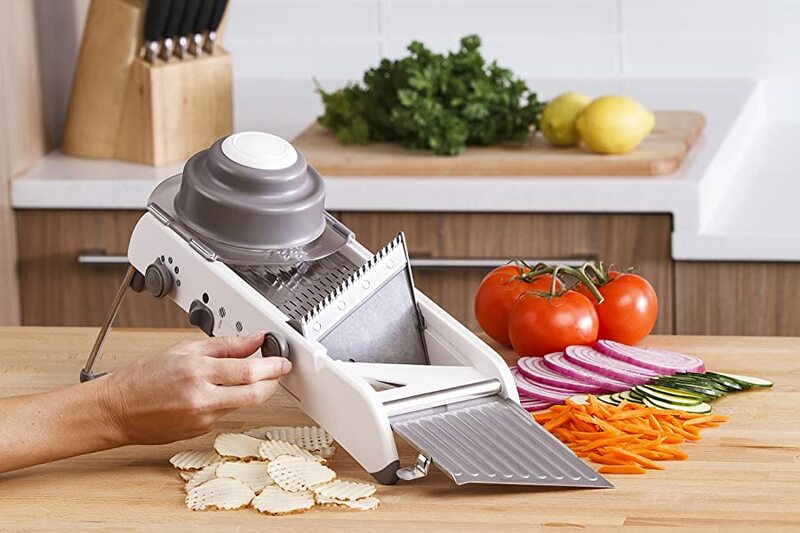 As you can see, this professional-grade potato slicer is the best mandoline slicer on this list. It’s also designed with blades that can be controlled by just turning the knob. For storage, you can fold it to make the unit more compact. Here’s a very simple model of potato slicer – and it’s also suitable to use for other types of food (particularly, apples and mangoes). It comes with 3 attachments with 3 different types of blades – 1 for cutting potatoes, 1 for apples, and 1 for mangoes. Only 1 attachment is used per task. As a potato slicer, this model is particularly good at making potato wedges. In fact, pressing the blade (with a safety handle, of course) over a regular-sized potato can make 36 slices in one passing. With stainless steel blades, the edges remain sharp and rust-free when due care is exercised in using it. The attachments are also color coded – so, you can quickly distinguish the blades from one another. As for the plastic parts, they’re all BPA-free and safe to come into contact with food. Easy operation – The attachments are color coded (potato slicer – green, apple slicer – red, mango slicer – blue). All you need to do is press down the slicer over the food to slice it. Sharp blades – It uses stainless steel blades that are very sharp and effortless to use. Easy to clean – This model of potato slicer is dishwasher safe (top rack). Safe to use – The safety handle keeps your hands and fingers away from the blades. Good grip – The device offers good grip and will not slip from your hands during use. Limited functionality – As a potato slicer, it can only produce slices that are suitable for French fries and wedges. And although it can be used for other types of food, the other attachments are only recommended for apples and mangoes. Need some help – Sometimes, food ingredients aren’t cut through completely and will need a little help from the user to separate the pieces apart. If you’re looking for a very simple potato slicer that can make potato wedges, this model makes for a fine choice. It also comes with blade attachments that can be used in slicing apples and mangoes. 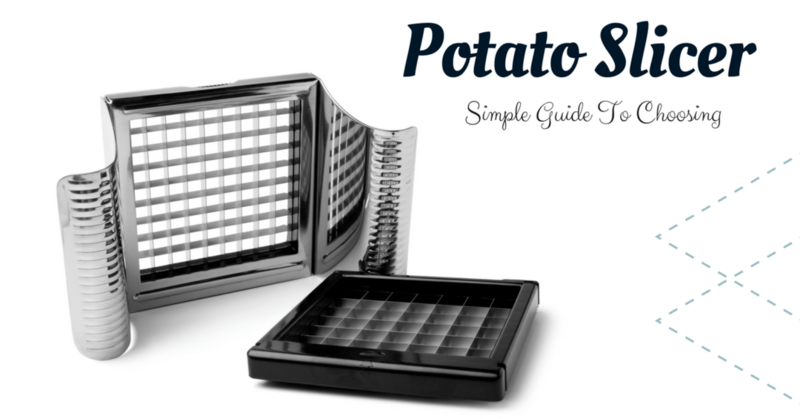 There’s no doubt about it – your life in the kitchen will surely be easier if you have a potato slicer around. When used properly, this tool is actually effective and safe – and a real time-saver at that! If you are a potato lover, I highly suggest going for the Benriner Mandoline Slicer. 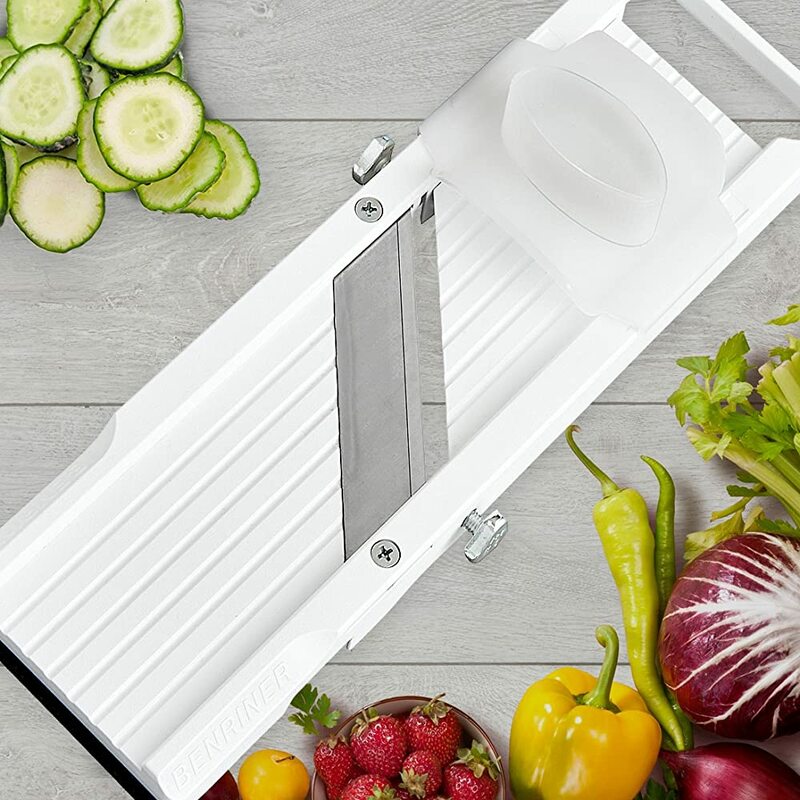 It’s a hardworking model of potato slicer and can also be used for slicing sweet potatoes, carrots, zucchini, eggplants, tomatoes, and more. This versatile model of potato slicer can also make thin cuts of potatoes as well as thick ones. The other products included in the Top 5 list are also good – and you can choose from any of them according to your needs and budget. In any case, however, make sure that you use the included handguard (or food holder) or your own food gloves to protect your hands and fingers from being cut. Don’t forget to share this post with your friends if you find it useful, ok? And as always, I would appreciate any feedback from you, too.